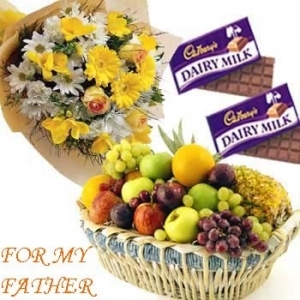 Yellow geberas five stems and yellow roses five stems bunch.Two cadbury's dairy milk chocolate Bars 23 gms each with 3 kgs of mixed fruits arrange in a basket. (Pineapple,apple,grapes,oranges).Perfect to gift for any occassion. Yellow geberas five stems and yellow roses five stems bunch.Two cadbury's dairy milk chocolate Bars 23 gms each with 3 kgs of mixed fruits arrange in a basket (Pineapple,apple,grapes,oranges).Perfect to gift for any occassion.